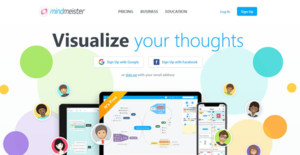 MindMeister is a powerful, cloud-based mind mapping tools that help individuals and teams in schools and businesses to visually capture, nurture, and share ideas. It’s a reliable collaborative tool that offers impressive graphical techniques to help users brainstorm, create project plans, take notes, manage meetings, and perform other creative tasks online. The platform is OS-agnostic which means it allows users to access mind maps inside the web-browser whether they are working on Linux, Windows, Mac OS, Android, or IOS devices. This is a reliable information visualization tool that provides a flourishing, shared environment where users in different places can collaborate and solve problems in real-time. Students can work together on the mind maps from school, home, and on the go to impeccably link their homework and classroom activities. Some of its notable features include mind map editor, history mode, import & exports, mind map presentation, publishing & embedding, and project management. MindMeister offers endless possibilities of mind maps which make it an ideal replacement to the traditional mind mapping and collaboration applications. It’s a reliable tool that is employed by businesses to aid collaboration, ideation, meeting management, and strategic planning. On the other hand, the solution is used in learning institutions to visualize complex problems, better engagements in classroom/lecture halls, take notes, and share solutions. One of its salient features is the online mind map editor. The editor is expertly designed to allow users to create, share, and present content right inside the web browser. This feature allows you to customize maps using the available themes, styles, color, and formats to replicate your brand. Its cloud-based nature means no software download is required. Content is securely archived in the cloud and is accessible from any device provided there is an internet connection. Additionally, MindMeister’s brainstorming techniques foster innovation and creativity like hardly any other application. It helps you come up with actionable tasks from ideas, assign these tasks to contributors, set due dates, add priorities, and task project progress using the task widget. Better still, the solution integrates with MeisterTask to facilitate more elaborate project management. It permits you to seamlessly synchronize tasks between mind maps and the agile project board. The integration offers a comprehensive workflow from the initial idea to the completion of the project. Another advantage of MindMeister is that it’s highly intuitive. The platform is designed to facilitate a flat learning curve to ensure you get the best out of your team right away. Better still, the solution is a reliable visual organizer that makes project management enjoyable with a fantastic project overview. It ensures all project contributors are always up to date with the project progress. If you are considering MindMeister it might also be sensible to investigate other subcategories of Best Mind Mapping Software collected in our base of SaaS software reviews. It's essential to keep in mind that hardly any software in the Mind Mapping Software category is a perfect solution able to fulfill all the requirements of different company types, sizes and industries. It may be a good idea to read a few MindMeister reviews first as some software might perform well exclusively in a very small group of applications or be prepared with a very specific type of industry in mind. Others may operate with an idea of being simple and intuitive and consequently lack complex features desired by more experienced users. You can also come across apps that focus on a broad group of users and give you a powerful feature toolbox, however this frequently comes at a higher cost of such a software. Be certain that you're aware of your requirements so that you choose a software that provides exactly the elements you look for. How Much Does MindMeister Cost? We realize that when you make a decision to buy Mind Mapping Software it’s important not only to see how experts evaluate it in their reviews, but also to find out if the real people and companies that buy it are actually satisfied with the product. That’s why we’ve created our behavior-based Customer Satisfaction Algorithm™ that gathers customer reviews, comments and MindMeister reviews across a wide range of social media sites. The data is then presented in an easy to digest form showing how many people had positive and negative experience with MindMeister. With that information at hand you should be equipped to make an informed buying decision that you won’t regret. What are MindMeister pricing details? What integrations are available for MindMeister?